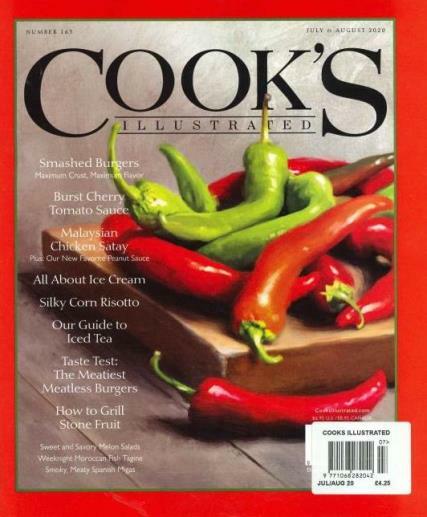 Cooks Illustrated is a bi-monthly cookery magazine from the people behind America’s Test Kitchen. Buy a single copy or subscription to Cooks Illustrated magazine. The magazine provides readers with step-step recipes and hints and tips for using new processes and utensils. If you are after learning new cooking techniques, learning about new products and food recommendations then this is the right magazine for you. Everything within these pages is exhaustively developed by a Test Kitchen facility – this is the same kitchen featured on the cooking show, America's Test Kitchen. Included you can find the best ways to prepare some of your favourite dishes, from pot roast and chocolate chip cookies to grilled salmon and fruit cobbler. Learn about the best (and worth) cooking equipment from knives to cookie sheets. You can also read all the best brands in the business - from canned tomatoes to baking chocolate. It also features all those chef techniques that you see on the television - from brining shrimp to baking ham. So if you would like to learn everything about cooking, useful tips, tricks and methods, then make sure you pick up this mouth-watering magazine!